Poor quality photos. If this was caused by time constraints, then something should be changed in the structure of the competition to allow there to be more time spent taking good quality shots. This is a painting competition after all, but you get the feeling that the efforts of the entrants are not given the respect they are due. I assume that more care will be taken with the UK photo shoot. And speaking of more care being taken... I'm pretty miffed in the condition my poor stegadon was in when the photo's were taken. One bent totem and one completely snapped off in the official photo. So my broken mini will now be the official testament to hours and hours of work. Cheers. I know that some damage is likely to happen when your GD entry is put in a suit case and sent as check in luggage to another country (baggage handlers strike again). But I was assured that any obvious damage would be fixed before judging and the official photo shoot. It seemed to be ok in the photos taken that were posted on here though, so maybe damage was fixed after the photos (WTF) of it was dropped and broken before the photos (again, WTF). @ norwestie- I think anyone would be miffed with any of that. I'd be ranting already, broken pieces, rubbish photography and you haven't even got it back yet. You've got more patience than me then. On other notes, I can't really tell too much from the GW photos, I didn't go on the day. So unlike the people who went I'm left with only the impression of the photos. Lucky contenders have posted better pictures so I can see why they get a demon. GW have just showed how little they care for the Australian GD, lazy photography, misreputation of the quality of the Australian painting scene. unfortunate about the damage, I feel your pain, I designed my entries so that they were robust and/or easy to handle... that said its not cool to have your mini manhandled and broke. I hope that it arrives in good cond. with your trophy. @ Angora and posters this my apply to. I has come to my attention that there are accusations being made not only on this forum but on others. I would be very careful about making slanderous comments in public without proof. I can assure you this matter has been fully investigated by the event organisers and they have been in contact with the people who are actually involved. To save any controversy, and with the agreement of all parties involved, the Demon for the Vehicle category was was handed back, and given to 4th place. As he had not cheated he was able to retain all other Demons won. The person at question will also be able to enter next years GD without limitation. However, if this isn't enough information for you I suggest that you either get in contact with GW AU directly or I'm sure you can contact Bohun by sending him a PM or finding the email from his site. Failing that please feel free to PM me. Can anyone here that is actually 'in the know' tell us if this is actually the case, or just more bullsh*t.
I was seriously considering coming this year, but my lovely wife is due to give birth in a few weeks and all of our money seems to be getting poured into the soon to be parents vortex of doom. "To save any controversy, and with the agreement of all parties involved, the Demon for the Vehicle category was was handed back, and given to 4th place"
What a crock... - GW wouldn't remove the name and revoke the trophy purely based on "saving any controversy..." It is either cheating, or it is not - if it is, then all rights should be removed, if it's not - then they should leave him alone, full stop. Either way, it appears to be a bit of a band aid measure that is ineffective and certainly provides no real deterrent for any other idiots trying to do the same thing in the future. I remember when looking at the duel entry and even commenting on it in the photo's thread about the difference between the quality of the scout and the rest of it - in hindsight, it looks obvious that it has been painted by two different people. Why hasn't that been pinged also?? The main thing that bugged me about it winning a trophe was that it had the exact same scheme, style, level of expertise etc. as the Dreadnought that was DQ'd... Im just confused why that wasn't DQ'd with it, as it's obviously done by the same painter that did the Dread. Interesting. Personally I havent not directly brought up any names etc and I have heard different things around this but I thought this could be easily overcome with wip shots by that person or if two miniatures of the same thing existed then once again photographs etc. Any other work the individual might have painted etc. It has been up to GW to decide the merits in this case and officially there has been a final decision made- we are just commenting on that decision. If there is any doubt why not allow the painter to prove he CAN indeed paint such things? Sit him down in a games workshop store and get him to paint similar freehand swirls as displayed on the Dreadnought. The same scratching details on the scout, just paint a shoulder pad or something small. If the guy did paint these models he will be able to get the same effect fairly quickly, even if not as refined the colours should match and the freehand should be crisp. A painter does not need perfect lighting and conditions to paint a high quality so any GW store's painting table should suffice (I regularly paint in GW stores). I would think this would have been a better way to resolve the issue than to "save any controversy, and with the agreement of all parties involved, the Demon for the Vehicle category was was handed back, and given to 4th place"... This just seems to point to the model indeed being as it seems and someone is trying to save face so that they can enter models next year, perhaps painted by themselves, perhaps not? I myself would have no problems in doing this if my entry was questioned and I doubt any of the painters who regularly win awards would either. Ok guys....I've had enough, I'm over this situation and controversy. I've been biting my tongue for ages (along with Kyle), out of courtesy to GW as the organisers/owners of GD, and because neither of us - as regular competitors in GD -wanted to seem like we had undue influence over the running of the competition or the way the rules are enforced. 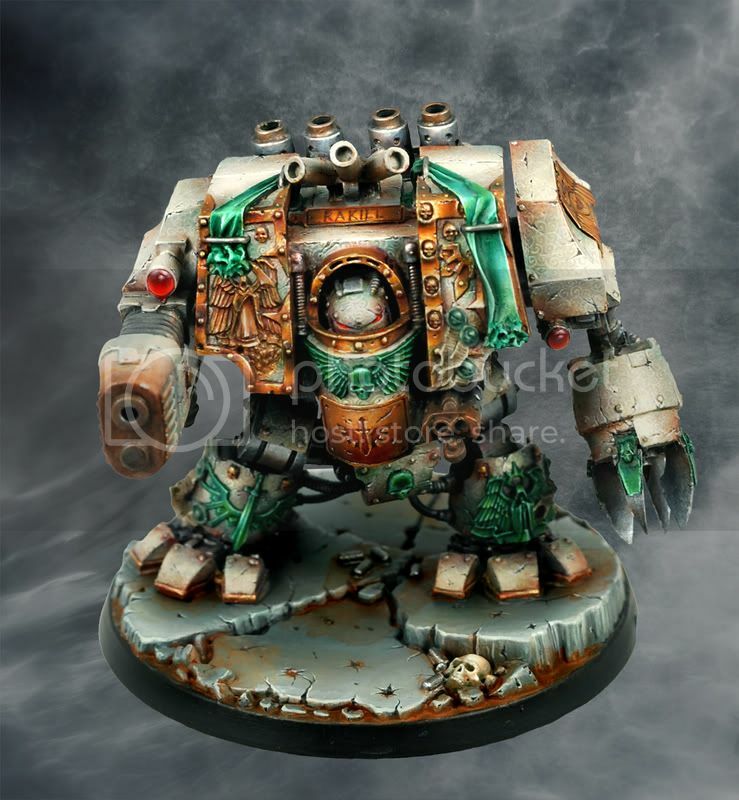 I have to say.... if this guy is did infact manage to copy the original Dreadnought, so much that it even came down to getting the battle damage and rust in the exact same spots, then he is truly entitled to winning that Demon.... Hell he should have won the Slayer Sword for being able to copy the original to a tee.... I mean why paint minis when this person clearly has the skill to copy any artwork.... next stop, copying the Mona Lisa! I agree that this is completely unfair, but I'm ready to move past this incident and paint again. I know that I'm a better painter and fairer person then this fool will ever be. What's done is done. Its obviously Bohun's dread. He cheated. People cheat all the time. I'm used to it. I was annoyed at the beggining and had some fun with it later, now I'm over it. What have we gotten from this incident, that the internet flushed out a cheat, he has been caught cheating previously and will do it again based on previous history, its an easy system to rort and we all dislike cheaters. Seriously, you're better painters and people then this douche. Try not to let it turn you against an event that we mostly like in the end. Whats the story with the other 2 entries? Is Bohun aware of these as well? Is that "duel" scout's head sculpted? Can you share what you uncovered, Kyle? I feel sorry for the guys who sacrificed time and sanity on their entries only to be dudded out of a trophy by dubious means. That said it doesn't surprise me at all, back when I was a little better known on CMoN I had a few people ask me to paint up demon entries for them, they generally offered double the going rate to pay for the miniature and a zipped lip (none were accepted). One of my commissions did however end up in a US demon only to be recognised before any harm was done - hard to dispute a few months worth of WIP shots. Hopefully now that it's basically been proven that the dread is not by the entrant the other entries will be disqualified and others will be recognised. Possibly too much hassle for GW though? Good luck to those involved on the right side of things.